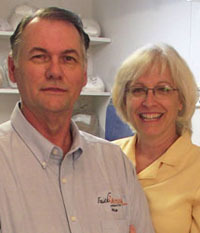 When you contact us at Faith Vessels Pottery For Worship, you'll speak with either Hue or Marla Parnell, owners of the business and creators of all the pottery we sell. We are not a large company with a storeroom filled with pre-made, molded or imported pottery ready to ship to you. Instead, we will personally create every piece of wheel thrown pottery especially for your church in our studio in Mint Hill, North Carolina. In some cases, we will have exactly what you order already made and in stock, so we will be able to ship your pieces quickly. Hue is a stoneware and porcelain potter as well as a former United Methodist local pastor. About ten years ago, area pastors began to ask him to create communion sets and baptismal bowls for their churches. It was then that we found that there was a real need for aesthetically beautiful and high quality ceramics to enhance worship services in sanctuaries and chapels throughout the United States. We founded Faith Vessels Pottery For Worship to fill that need. Today, we provide churches with not only pottery but also handcrafted baptismal font stands, communion tables and other church furnishings. We believe that God makes it possible for us to draw on our talents to create distinctive products used to glorify His name. You can be assured that each piece you purchase from us is wheel thrown and glazed using superior materials throughout the creative process, resulting in pottery that is highly durable and made to last for years. It is our hope that as you look at our baptismal fonts, communion sets and other pieces, you will recognize the quality porcelain that you are searching for to enhance your church's worship services. Please call to discuss your needs or simply place your order online. We promise is that you will have an exceptional experience when you make your purchase. We invite you to take a moment to learn more about us and other forms of artworks that we create by visiting parnellstudios.com. Copyright Faith Vessels Pottery For Worship. All Rights Reserved. Sell Online with 3DCart.